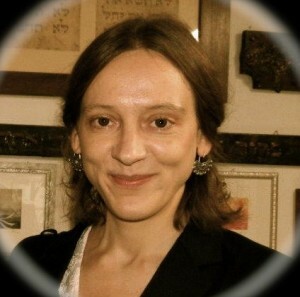 Rahel Fronda is the Hebraica and Judaica Subject Librarian at the Bodleian Library in Oxford. Her professional experience also include work with rare Anglo-Jewish material, notably the Moses Montefiore collection; and translating short stories from Hebrew. Her academic background is in Jewish Studies, more specifically the Hebrew Bible and Old Testament Theology. She has read Hebrew, Aramaic, Latin, Ancient Greek, German, French, Russian and Swedish. Her research interests include Hebrew micrography and illuminated medieval Hebrew manuscripts, medieval Jewish history, codicology and palaeography and early printed Hebrew books. Recently, she has successfully defended her PhD thesis. Her doctoral research involves several disciplines, combining art history with codicology and palaeography, and Old Testament theology and linguistics with intellectual and social history of German Jewish communities in the Middle Ages. In her thesis, she examines the production of a specific group of ornamented 13th and early 14th century Hebrew manuscripts from France and Germany. The 13th century is a crucial period in the history of Ashkenazi codicology, with the appearance of first illuminated manuscripts. While painted illumination and some of its specific iconographical features have already received considerable scholarly attention, micrographic ornaments in medieval Ashkenazi Hebrew Bibles still deserve further study. The spread of this unique artistic phenomenon and its classical period attest to the emergence of relatively well-established Ashkenazi Jewish communities.